Cooked to a delicious golden crisp, our Crunchy Breaded Fish Fillets are an easy, family-pleasing meal ready fresh from the oven in just 15 minutes. 3. Bake 13-15 minutes total* Flip after 7 minutes. 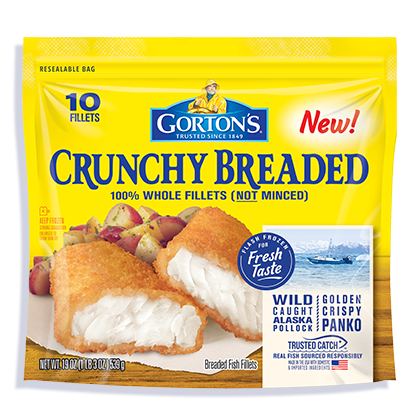 INGREDIENTS: Alaska Pollock fillets, breadcrumb coating, vegetable oil. Wheat flour, water, yellow corn flour, sugar, salt, whey, yeast, baking powder (baking soda, cream of tartar), onion powder, natural flavor. 120mg of EPA and DHA Omega-3 fatty acids per serving.